A planned strike by UC hospital workers has been canceled after a new tentative labor agreement was reached. A planned five-day strike by University of California hospital workers has been canceled, after a tentative labor agreement was reached during last-minute negotiations. The new four-year deal between the UC and AFSCME 3299 was reached Sunday morning following bargaining sessions over the weekend, the Contra Costa Times reports. The deal, which covers 13,000 patient care technical workers, includes across-the-board and step increases totaling 24.5 percent over the period. 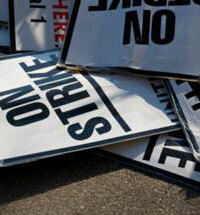 The agreement is set to go up for a union vote later this week.